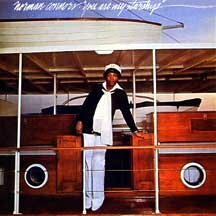 You Are My Starship is an album by the Philadelphia, Pennsylvania jazz drummer Norman Connors. Released in 1976 on Buddah Records, it featured bass player/vocalist Michael Henderson and Philadelphia, Pennsylvania vocalist Phyllis Hyman. The album reached number five on the US R&B chart and number one on the Jazz chart. The single, "You Are My Starship", charted at number four on the US R&B single chart. The boat on the front cover belonged to actor John Wayne. ^ "Norman Connors US albums chart history". allmusic.com. Retrieved 2011-08-14. ^ "Norman Conners US singles chart history". allmusic.com. Retrieved 2011-08-14. This page was last edited on 11 March 2019, at 08:51 (UTC).